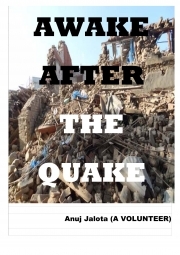 Description of "Awake after Quake (eBook)"
It is a book about realisation of social responsibility. It describes my seven days in Kathmandu in earthquake relief work. It shares my experiences with people and with nature and also a basic human trait called ADAPTATION. Reviews of "Awake after Quake (eBook)"
A true insight of what happens to the society after a disaster has taken place and it's of lime light. alot of people care show empathy for the victims when they are in limelight but only a true inspirational leader can come up to emphasize with those who have no hope left with them. keep on the good work. hope someday i can be a person like the author too. Sir I am the current student at P.A(andheri Batch). i have recently started distributing them Umbrella in this season. i know it is very small step,but a lot of small step turns into big initiative.